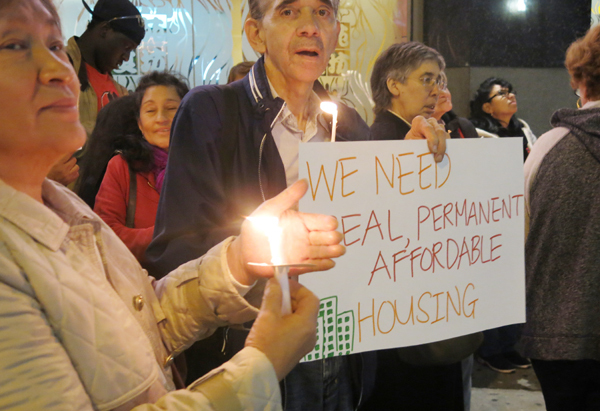 Members of the Flushing Rezoning Community Alliance at a demonstration this week. Seven community, faith and labor organizations joined together last week to form the Flushing Community Alliance, a collective effort to fight for equitable rezoning in Flushing. The group was created as a response to the ongoing studies leading up to the eventual rezoning of an area dubbed “Flushing West” by the City Planning Department. The Alliance aims to organize Flushing communities to ensure that the city’s rezoning process includes permanent affordability for Flushing residents. Other objectives include ensuring meaningful community engagement in the rezoning process, improvement in infrastructure, housing plans for low-income seniors and promotion on small businesses. The Flushing Community Alliance currently includes Faith in New York, the MinKwon Center, St. George’s Episcopal Church, the Unitarian Universalist Congregation of Queens, District Council 9 New York IUPAT, Korean Community Services of Metropolitan New York and YWCA of Queens. The group will hold monthly public town hall meetings where residents and local stakeholders are invited to share information on rezoning and participate in dialogue about the community’s needs. Grace Shim, executive director of the MinKwon Center for Community Action, said that this movement was necessary because Flushing is home to many immigrants and low-income families in dire need of affordable housing. Wilfredo Benitez, Rector of St. George’s Episcopal Church, said that as a faith leader he hoped to raise awareness of the need for truly affordable housing in the area.